Having the bridesmaids and flower girls in matching outfits has long been the trend in weddings, but we're seeing more and more people stray from this tradition. Mismatching is in, allowing you to tailor your bridesmaids’ look to suit their personalities. Even if mismatching the dresses is a stretch too far for your liking, this trend can be mirrored in the accessories you choose. Below are some top tips to choosing accessories to show off your bridal party. Did you know that it is an old tradition for the Maid of Honour to wear the same colour dress as the bride? (think Pippa Middleton at the royal wedding) Whilst this may be a tradition too far for many brides, an alternative would be to have her wear a similar headpiece with a similar arrangement to your own, or a pendant form of your own statement necklace. If your bridesmaids and maid of honour are wearing the same dress, choice of accessories is a nice way to subtly differentiate between the two. Choosing a headpiece for the younger members of your bridal party can be tricky; from fidgety toddlers to fine hair issues, a piece that the wearer feels comfortable in and doesn't want to pull it out is a must. Always take into account the weight of the pieces versus the thickness of the wearers’ hair; the thicker the hair, the more weight it will be able to hold without slipping out. For this very reason, we do not recommend combs for the youngest members of the bridal party as they are more likely to fall out; instead, why not try a clip as an alternative? For very fine hair (and the smallest, youngest heads! ), we find that lighter headbands with a delicate side detailing work well. Picking hair accessories for an older bridesmaid can have its own problems, especially if you have a selection of people with different tastes. Consider a running theme, for example, if you have pearls in your piece use this as a starting point when choosing accessories for your bridesmaids. They don’t all have to wear the same, but the key to mismatching is to have a common element. Scrapping the rigidity of matching also allows flexibility in choice to hopefully please everyone. Ultimately, remember that this is your big day and you have the casting vote which your bridal party should be supportive of, especially as you are footing the bill! 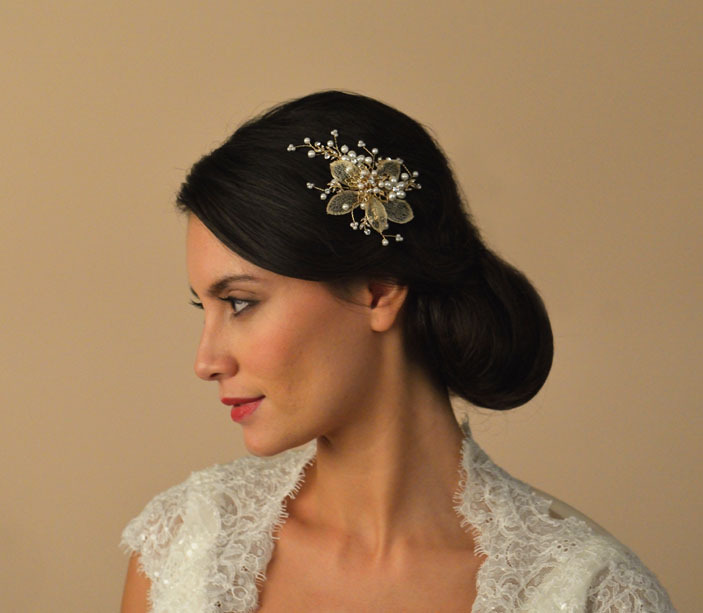 If you are planning a wedding on a budget, consider how important hair accessories or jewellery is to your overall look. If you cannot stretch to both, but want to give your bridesmaids a gift on your wedding day, consider purchasing an accessory and wrapping it as a gift to present on your wedding day as a surprise. Maybe an impromptu trying on of accessories when dress shopping could give you a good idea of which accessory would be the best gift for each individual bridesmaid, or maybe you're lucky enough to have them all agree on the same piece! Either way, this budget friendly surprise will be well received on your big day. Whatever you decide on for your bridesmaids, kitting them out can be costly. If you are buying a few pieces from one retailer, ask for a discount. Veil Lengths - Everything You Need to Know!